The dedication of two community groups from Cork to the preservation and promotion of the county’s heritage was recognised yesterday (06.02.19) at the National Heritage Awards 2018 and closing ceremony for the European Year of Cultural Heritage 2018. The special event at the Royal Irish Academy was attended by Minister of State at the Department of Culture, Heritage and the Gaeltacht, Seán Kyne TD and presented by RTÉ broadcaster, Mary Kennedy. Hosted by the Heritage Council, the National Heritage Week Awards highlight Ireland’s ‘heritage heroes’, and showcase the most engaging and innovative National Heritage Week events. Close to 700 nominations were received across five categories in 2018. The Crawford Art Gallery won the Heritage Communities Award. This category recognised events that brought communities together to celebrate National Heritage Week. Its event ‘Creative Connections’ created pathways for women living in Direct Provision to get to know some of their neighbours outside of the accommodation centre. Participants, some of whom were women living in Direct Provision, and their neighbours, worked together to create individual textile panels, exploring the themes of hospitality and sharing stories. ‘Creative Connections’ invited the general public, makers, artists, educational, civic and community stakeholders to respond to collaborative textile work created by women of seven different nationalities, meet the makers, and to try some simple textile techniques. Cork County Council was shortlisted for a Cool for Kids Award. This category recognised events that helped children learn about and enjoy heritage and encouraged children and families to participate in National Heritage Week. Its event, the ‘Youghal Medieval Festival’, now in its 12th year, welcomed over 8,000 visitors of all ages, and offered activities including archery, archaeology, talks, walks, tours, medieval village living and kiddies medieval battles. · The Heritage Hero Award: Eugene Dunbar. Since retiring from teaching geography at second level, Eugene has devoted his energy to local heritage in Westmeath. He is a founding member of ETHOS (Everything Tyrellspass Has On Show), a group set up to promote and enhance local heritage in Tyrellspass. Eugene is also involved with the Community Wetlands Forum, Birdwatch Ireland and the Clongrow Bog; and he regularly organises traditional music sessions, Irish language conversation meetups, geology lectures and biodiversity walks in Tyrellspass and beyond. · The Hidden Heritage Award. ‘By Hammer, Lens and Pencil’, an exhibition by Kerry Geo Adventures and Kerry County Museum. This project shared a story about forgotten Irish geologist Frederick James Foot (1830-1867), who surveyed the Irish landscape in North Kerry. The exhibition mainly focused on his artistic drawings, which had never been on public display before. Through Foot’s artwork, the collaborating organisations were able to reconstruct features of coastline, nature and archaeology of past times. · The Cool for Kids Award: ‘The Master and the Mystery’ at The Irish Workhouse Centre in Co Galway. This dedicated children’s event shared the challenging story of the workhouse system through art and drama. Each child was presented with a special pack which explored the parallels between poverty and homelessness in Ireland in the nineteenth century and today. · Le Chéile san Eoraip Award: ‘Peat Crossing Borderlines’ – Irish Peatland Conservation Council. The Irish Peatland Conservation Council’s event shared the Dutch-Irish ‘Save the Bogs’ story and built awareness of the importance of Ireland’s peatlands at a European level, strengthening the connection between Ireland and the Netherlands. · Le Chéile san Eoraip Award: ‘A Taste of the Past: Exploring Our European Connections’ – Loughrea Medieval Festival. This event highlighted the cultural similarities and differences between Ireland, Hungary and Spain through talks, food and drink, and music from all three countries. · Le Chéile san Eoraip Award: ‘An Exhibition of Kilrush Ceramics’ – Kilrush and District Historical Society. This exhibition celebrated the once nearly forgotten ceramics industry in a small West Clare town, and its European connections. From 1961 to 1983, Kilrush Ceramics, owned by the Ueblacker (later Rosenthal), employed over 100 people. The exhibition showcased a selection of its colourful and quirky products made at the factory and explored its history in an Irish and European context. 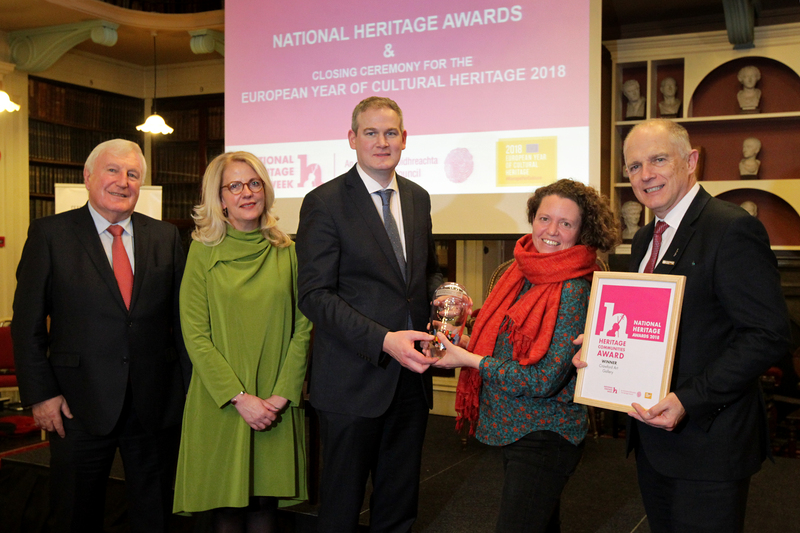 Speaking at the awards, Minister Kyne said: “It is a privilege to attend today’s National Heritage Awards and to meet just some of the individuals and community groups who proudly fly the flag for Ireland’s rich and varied heritage. Their efforts in this regard are recognised and greatly appreciated. Newly appointed Chief Executive of the Heritage Council, Virginia Teehan said: “Heritage Week and the National Heritage Awards highlight the fantastic work that is carried out in communities across Ireland to preserve and promote our natural, built and cultural heritage. I am delighted that today’s special ceremony marks my first public event since I took up the role of Chief Executive of the Heritage Council. It is wonderful to see such commitment to our shared heritage among individuals and community groups, and to celebrate this commitment with an exciting programme of Heritage Week events every year. More information on the National Heritage Awards 2018 is available at www.heritageweek.ie/about/awards.